Seriously, Make me an offer if you are interested in this gorgeous piece! 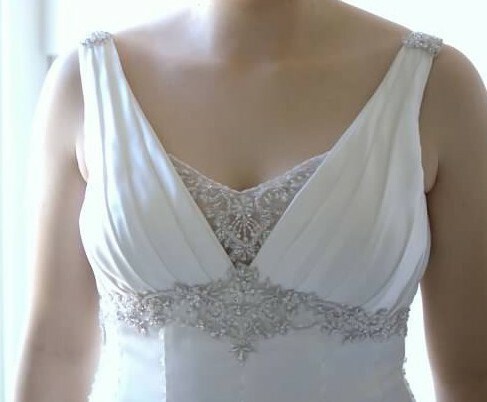 Stunning Dress (and two veils!) in amazing condition! Beautiful ivory satin (polyester) slim gown with vertical beading, pleated bust with removable (currently sewn in) beaded insert for less cleavage, beaded waist and beaded illusion back. The back of the dress is exquisite, which is why I fell in love with it. Delicate rows of beading cascade down the gown and follow the sweep train. Museum quality garment preservation bag included. Gown cleaned and preserved to highest standards and stored in acid-free bag immediately after wedding. Purchase also includes blusher veil and floor-length veil that goes past the train of the dress. Alterations made (dress hemmed) for bide who was 5’2” but had added height due to 3 1/2 “ heels (so dress could probably work for taller people in shorter heels, too). Also, removable beaded insert/modesty panel was sewn-in but can still easily be removed.